...psyche! Looks like someone's PR budget just ballooned! 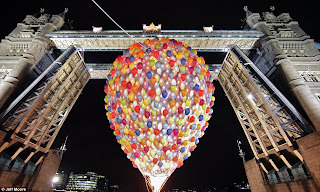 Londoners witnessed a unique sight this past Thursday when their iconic Tower Bridge swung open to permit a massive hot air balloon to sail through unscathed on its journey down the chilly Thames. 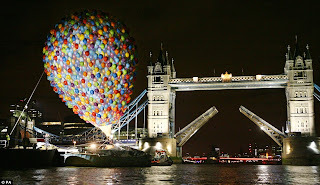 Marking next week's UK cinematic opening of Disney-Pixar's "Up", the hot air extravaganza featured one huge balloon covered with 500 smaller half-balloons, pulled by a trusty tugboat. Tower Bridge typically allows only regular water craft to pass through its drawbridge but in the past has also welcomed a cheesy promotional statue of Michael Jackson back in 1995 (I was there visiting the Tower of London that day, and couldn't believe my eyes!). That's so cool! That's my new background picture. Thanks for blogging about it! Isn't it neat? I can only imagine how awesome it must have been to see it in person. Definitely cooler than an MJ statue. Talented as he was.